Urban planning, infrastructure design, and mobility policy are up against a tough system-level challenge: the rapid adaptation of shared mobility. The new mobility is destabilizing the current auto-oriented transportation paradigm, and gradually moving towards a new mobility ecosystem. In order to capture the potential and create shared infrastructure, an innovative mobility planning model based on a scientific approach was developed to identify context-sensitive area solutions and the scaling of the proposed ecosystem for short-and long-term horizons. The approach first lays out an overall path of transformation to a future ecosystem that maximizes the social, environmental and economic well-being of users. The development of basic principles including limiting boundaries or constraints and interdependency between basic city building elements has been analyzed through maximization of social, environment and economic benefits. The second stage establishes the link between the policy variables of land-use and mobility options while formulating the multimodal demand forecasting and infra-structure needs assessment process. Finally, the demand and supply scale of shared mobility is developed with innovative policy and implementation strategies that minimize or eliminate negative impacts on quality of life. In addition to new planning approach that integrated emerging and future mobility system into master planning process, the project introduced two new mobility system concept to address first-and-last and easily accessible multimodal locations for short trip needs in urban areas: 1) Ecomobility Points – a multimodal one-stop service points for all users by redesigning public parking, transit service locations and semi public/private locations, and 2) EcoMobility Placemaking – creating a new form of public space from unused pavement spaces given to vehicles while enhancing green space, new space for shared and emerging mobility modes on streets or private/public locations, proper trip end facilities for shared autonomous vehicles and incorporating water infrastructures. 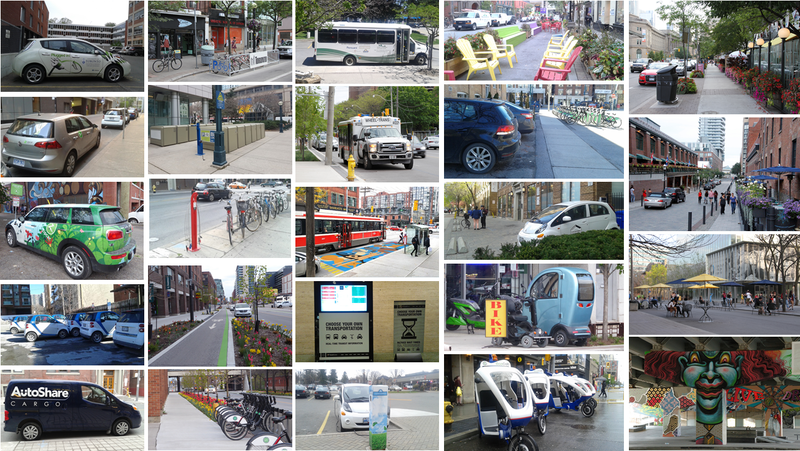 Roughly seventy “EcoMobility places” created a soccer field size new public space in Toronto. Identification, reallocation and redesigning the place is not widely recognized and practiced to urban planners and designers prior to the project. Organization: Transportation Planning North District Team, City Planning, City of Toronto.